In honour of the Ikea Swedish Meatballs that we had for dinner tonight, today’s post is all about Sweden. Just kidding…..slightly. I did in fact have Ikea meatballs and if you get the chance to get buy them from the Ikea food section along with the mashed potatoes and gravy, then do it because they are really easy to make and really good. Total hit here across the board which never happens. Today’s post is about Sweden though, but it was because someone asked not because of meatballs. 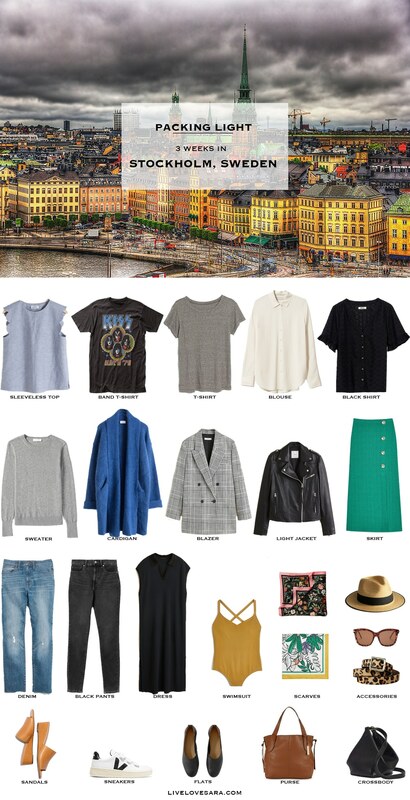 This post is for What to pack for Stockholm in June. When the weather is getting warmer by day, but the nights are still cool/cold. You are looking at an average of late teens to low 20s by day with plenty of sunshine. To fit in with the Swedish fashion vibe think simple/minimalist silhouettes in neutral-ish colours like black, white, gray, cream, and blue. I threw in a coloured skirt for a little extra, but pick whatever colours you are comfortable with. Shoes are tough for me in this type of climate, and since I wear sneakers more often than sandals in the summer it is easy for me to forget that many people prefer sandals. I decided to include a pair of slides for those days where the temperature hits the mid 20s, then when it cools at night you can easily swap to flats or sneakers. The northern location of Stockholm tied with its close proximity to water means that there will be a cool breeze coming off the water at any given time. During the day this may feel wonderful, but at night it will be cooler so make sure that you have a sweater or two, and a light jacket of some kind even though it is the summer. I included a belt in this list not only for use with pants, but also for the skirt, and to belt closed the cardigan or blazer for a different look. Something small can be used to help make a lot of different looks. *even if you do not end up using it, it is always a good idea to include a swimsuit on a summer vacation. It doesn’t take much room in your suitcase. You can easily roll it and slip it in a shoe if need be. *I have this t-shirt and it is AMAZING.